Bindings are often the last piece of ski gear you choose, but rare extremely important. They play a fundamental role as your connection between boot and ski. They allow for power transfer, responsiveness, and safety. The most common types of bindings are alpine and used for downhill skiing. Both the toe and heel of your alpine ski boots clip into the alpine bindings where they remain fully clipped unless you fall. 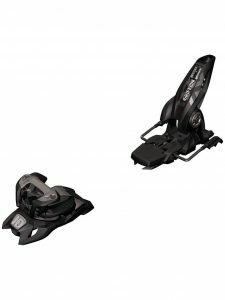 Some alpine bindings are compatible with AT and WTR boots. 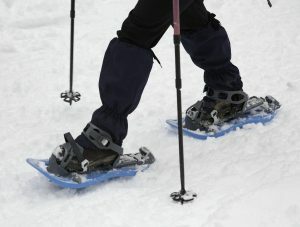 To get into a pair of ski bindings you simply slide your toe in and press down your heel to lock in place. Exiting is similarly easy by pressing down on the binding’s heel piece. We took a look at some of the industry’s best all mountain ski bindings and here are our 5 Top Picks. The Griffon 13 is a versatile alpine ski binding catered towards the intermediate to advanced skier who is looking to progress. It has a DIN range of 4-13. This allows for plenty of room for progression by catering to a variety of ability levels. These bindings can be used by both intermediate skiers getting started, as well as seasoned pros looking for high performance and boot sole versatility. The Griffon 13 is also fairly lightweight. The toe height is adjustable and can accommodate alpine, WTR, and AT soles. The toe height adjustment is paired with a sliding AFD that works with both slippery soles, as well as gripping rubber. 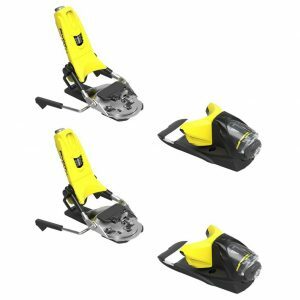 These are one of the most versatile ski bindings on the market. They are equipped with the Triple Pivot elite toe, providing extreme energy consumption to prevent pre-release. This is extremely helpful when you are straight-lining through choppy afternoon snow or airing cliffs. They also have a short mounting zone to allow for plenty of flex. There is a low amount of swing weight for greater control on jumps and big mountain lines. The Griffons have a wide footprint, built to accommodate wider skis. The brakes are easily interchangeable between varying ski widths. There are extremely easily to put on, you simply step in and they lock in place. Due to the toe construction, there is massive retention when free riding. The spring in the toe is inserted horizontally along with an inclined sole plate that provides high energy absorption. You will achieve high levels of precise release that is unhindered by dirt, snow, and ice buildup. The heel is constructed of an inter pivot heel, providing amazing holding power. This heel setup also reduces pre-releases. The Pivot 14 are a great ski binding with a short footprint, so there is plenty of natural flex. It incorporates industry-leading elastic travel to provide support for your knees. This helps to prevent knee injuries. The brakes are not swappable on the heel, so make sure you purchase the correct width for the ski to pair with. The binding is compatible with Walk-to-Ride (WTR) boots. The Pivot comes with an 18-DIN version, or light weight skiers can opt for the 12-DIN model. Due to the high levels of elasticity, the Pivot bindings have one of the best safety margins in the industry. They also have dual compatibility for both ISO Alpine and WTR rockered boot soles. The Pivot is loaded with a 180˚ multi-directional release toe piece that is extremely reliable. The toe housing is strategically reinforced which increases the top ramp, elongates the top wings, and gives versatility toe to sole compatibility. The heel piece has a vertical elasticity of 28mm, as well as seven points of contact. More points of contact with the boot gives superior lateral energy transmission. It also provides better response, control, and snow feel. The Pivot is equipped with a turntable heel design that provides shock absorption and consistency for lateral release. There is also a short mounting zone. You simply place the heel screws under the boot sole and it shortens the zone, giving more ski flex naturally. With these bindings, your boot will sit closer to the snow than other bindings on the market. You will experience great snow sensitivity, precision, and control under foot. 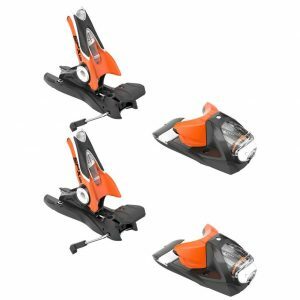 The Pivot bindings are also extremely durable. The STH2 combines the classic 3D Driver toe piece with a modified Guardian heel to give you bomber retention and reliable release. The toe is equipped with plenty of elastic travel, which allows your boot to move within the binding to prevent pre-release. The 3D design of the toe also gives release in any direction. Both the toe and heel are built on an over sized, low-profile platform that is designed specifically for wider skis. They also have progressive transfer pads for a smooth, damp ride. The STH2 is compatible with WTR boots, as well as classic alpine sole. This offers versatility in your ride. These bindings have a sturdy feel, good power transmission, and reliable durability. The wings are extra long which engages the boot better, allowing for easier step-in when in powder. It also provides more lateral powder. A fixed stomp pedal is incorporated to ensure easy transmission from skier to ski. You can also manually adjust the toe height for customization. In addition, the heel offers very natural ski flex. There are self-retracting Freeski brakes that eliminates hang ups on switch landings for increased precision. Superior elastic travel offers an extremely smooth and safe ride. The chassis have a low-profile so the feedback from the terrain is increased, giving more power transmission. The Jester are stainless-steel bindings that offer essential lateral boot movement. The toe cups and heel brackets are magnesium, which increases durability and control for wide skis. The Triple Pivot Elite toe also helps to absorb high levels of energy and prevent pre-release. The lightweight Inter-Pivot heel gives power within the boot sole, as well as offering great holding power and energy transfer. The Jester 16 is compatible with a variety of boot soles, including alpine, ISO, touring, and grip walk. The extra metal from the magnesium keeps the weight in check while also increasing rigidity. In addition, it adds security when landing big jumps. 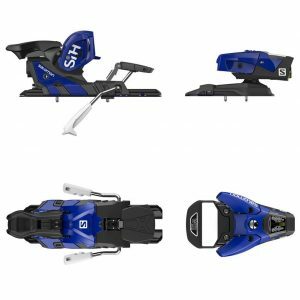 This is a great set of ski bindings that seem to target the more advanced to professional level skier. The Marker Jester has great retention and reliability, especially when free riding. The spring in the toes is inserted horizontally, with a sole plate incline by 5°. This provides higher energy absorption and reduces the risk of an early release. The large supporting surface optimizes power transmission and allows for great stresses and strains. The AFD gliding plate makes for precise release, unhindered by dirt, snow, and ice buildup. The Look SPX 12 are light but powerful ski bindings. Due to the full drive toe and oversized heel pivot design you get superior energy transfer and vertical elasticity in the heel. The also helps to prevent against pre-release. The toe piece offers 180˚ of multi-directional release, making the SPX extremely safe and reliable. You also get more power and enhanced steering and control with the auto adjusting full drive toe. In addition, it is equipped with reinforced toe housing, increased toe ramp, elongated toe wings, and a versatile boot sole compatibility. The SPX is compatible with both ISO 5355 Alpine soles and WTR rockered soles. 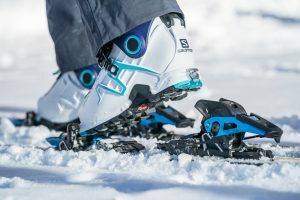 The oversized heel pivot delivers increased coupling strength for efficient and powerful energy transmission to the edge of the ski.The binding has and upright stance which leads to less fatigue and increases balance. These bindings are great for skiers that are in between absolute beginner and intermediate. It is a perfect all-mountain ski with solid feel and confidence, a great choice for weekend warriors. The high elasticity not only aids in pre-release but increases levels of shock absorption. 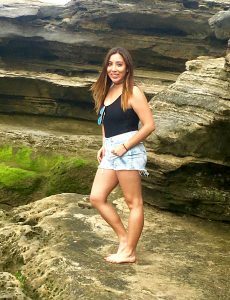 The metal construction is extremely sturdy and durable. You really can push the ski hard and achieve high levels of control with the SPX bindings. The wide mounting point also helps to increase power. You’ll want to make sure you have your skis first. They greatly impact which type of ski bindings you should get. You want to make sure that all the parts of your set up complement one another. Once you choose your skis and know where you will be spending most of your time skiing, you can then begin to look at some other factors to help you narrow down your decision. DIN is short for Deutsches Institut für Normung and refers to a standardized test. This test defines the amount of force necessary for the binding to release the locked in boot. The numbers range from 1 to 18, and the higher you go, the longer the binding will hold you. To prevent leg injuries in a fall, ski bindings are designed to release when a set force is applied. When you fall a certain way, your skis will pop off to prevent injury. However, you don’t want them popping of every side hit and have your skis go flying when you land. DIN indicates the force required before the bindings release. Lower DIN settings are usually used for beginners, children, and lightweight skiers. On the flip side, expert and heavier skiers will have higher DIN settings. In addition to not wanted a pre-release from your bindings, you also don’t want them to release too late. The perfect release time drastically impacts your safety and performance. There are a variety of weights to choose from. The lighter the bindings, the more expensive they will usually be. For resort skiing or lift-accessed areas, the weight of your skis isn’t as much of a factor. Backcountry and ski-touring are where weight really plays a huge role in energy conservation. Brakes are tiny arms that sit flush with the ski when moving and drop down when your ski boots are released from your bindings. They are designed to stop the ski from moving by itself. This is extremely important after a fall to prevent runaway skis from injury others or getting lost in snow drifts. Brakes should be wide enough to clear the edges of your skis, but not so wide that they touch the snow while you’re edging. To ensure this, you must know the waist measurement of your skis before purchasing your bindings. The breaks have to be wider than your skis. It’s always a good idea to select your skis prior to picking a binding, so you can match the brake. It’s also not a great idea to bend ski bars, even slightly. On the other hand, you also want to avoid a brake that is too wide as it may drag if you’re carving on hard pack. Alpine/downhill boots have soles that are compatible with alpine bindings and conform to ISO 5355. This is great for resort skiers. You’ll want to have your bindings fixed to your skis by a professional once you know your boot length, which is not the same as boot size. Ski-tourers will need other compatibility options. You can also look into dual-use bindings if you plan on skiing both ski-touring and resort. WTR means Walk-to-Ride and have more of a sole rocker, as opposed to the flat sole of an alpine boot. With WTR you can walk with more ease than when wearing standard alpine boots. The benefit of versatile compatibility is that you don’t have to worry about buying two very expensive boots to match a different ski setup. Or if you’re planning on switching over to backcountry gear in the future, you can still ski a downhill binding in the interim. Ski bindings are usually one of the last pieces of equipment brought into a skier’s tool bag. After falling a few times, you quickly realize the benefit. Good quality bindings designed for your skiing style will inspire confidence in you and make for a better time. Remember that high elasticity in the release reduces risk of injury and makes for a smoother ride. You want to be safe, stable, and responsive when out on the snow. The right pair of ski bindings is essential in helping you to achieve this. If you are beginner that is serious about getting into skiing, you will highly want to consider going with a ski binding that offers a large DIN range. This will allow plenty of room for progression and variety. You can alter the settings as you get better at the sport. Overall, don’t skimp on ski bindings. They may be a small feature, but they are easily one of the most important parts of your kit and can impact so many factors on your ride.